I found an English copy of this DVD at my local library recently and borrowed it (Note: There's also a French version). What a good find! Yet another reason why I love my public library. 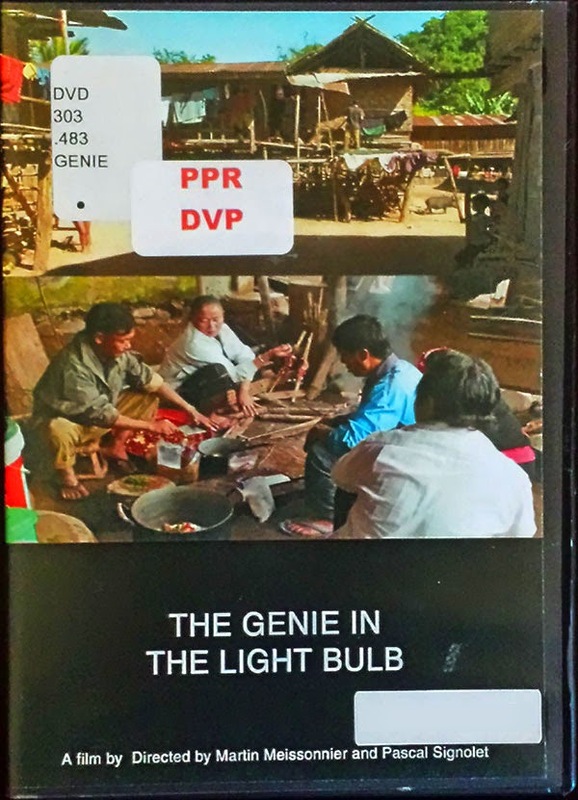 Essentially, the film makers follow the NGO Energy Without Borders on their project to bring electricity to a small, northern, remote village of Hat Hin in Phongsaly, Laos. Not only is the process of it all profiled but also the villagers themselves and how electricity changes their lives. Sprinkled in all that is a bit of village drama, the highs and lows. 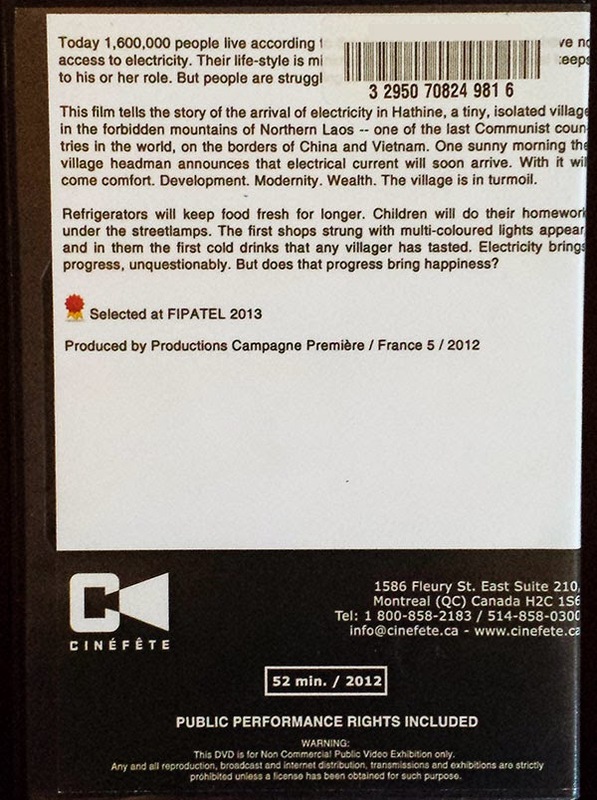 The film illustrates the desires of many in the village to have electricity as it would been seen as bringing them into modernity and on par with other villages or cities. The other hope is that it would simplify certain things in their life. It also shows how come nightfall, everyone is using flashlights or candles. This is shown by a housewife cooking with one hand and holding a flash light with the other. Or, with the kids holding flashlights while reading or writing doing homework. Next the film shows the NGO team arriving with their equipment first by truck which are then put on to boats. The 3 boat loads of equipment are carried to the village by the villagers. The villagers are integral in almost every step of this - which is wonderful to see. The NGO truly involves them both in training and in the use of their labor/manpower. For example, the film shows the NGO training the villagers on electricity - what it is, how it works, what equipment will be used and what to be careful of. Most of the trainees are men but the women and children listen along standing outside. Then the work begins. They dig out the water pathway where the river water will be diverted to. They then put plastic lining along where the water will flow. This allows the water to flow more smoothly and faster towards the turbine. The villagers also dig the holes for where the large wooden posts will go. The posts will hold the electrical wires for miles. Drama ensues when 3 elders in the village die when work in the village begins. Being quite superstitious, those events put a damper on bringing electricity to the village with many looking sombre. However the village headman, other villagers and NGO workers, determine it's best to continue on. However they say, as a caveat (and more to appease the villagers) should someone else die, they will all have to reassess how to move forward, if at all. Luckily no one else dies! Interesting side note: I'm not sure which ethnic minority this village is but they have this very fascinating custom of placing a communal comb at the entrance of the home of where someone has died. So when visitors come to pay their respects, they symbolically comb their hair to signify the brushing or combing away of negativity whether negative karma or negative spirits. This is to help ensure the person who has passed away does not come in contact, spiritually, with anything negative. As the film goes on, they are now finishing the digging holes for the final few wooden posts. But they find that they do not have enough wooden posts to get close enough to the village. Villagers are asked to cut down 4 more trees to be used as posts, while others continue to dig more holes. Finally, the final and closest post to the village is placed into the hole. There is joy and applause by the team and onlookers. The work of placing miles of electrical cables through the posts begin. The cables will carry the electricity created by the turbines. They complete this phase flawlessly. Now the actual test of whether the water turbine will create electricity begins. They pull up the wooden board to allow water to flow into the water pathway. The water flows towards and into the turbine. With anticipation they wait and see. A bit of electricity is created but unfortunately problems arise. The water does not drain away fast enough resulting in the water not flowing through the turbine fast enough. So the men quickly clear the draining pathway of further dirt and rocks while ensuring they don't bring down the whole structure. Success! The structure is still stable and the water begins to flow fast and electricity increases from 320 volts then 340 then 350. They have light bulbs connected at the turbine site. For the first time a light bulb comes on. Cheers from the team are heard. Then there's light at some parts of the villages and some homes for those who have paid to be a part of the program. Then the school is lit. All of the sudden, light bulbs begin to smoke and worried looks take over the face of the villagers. However the answer seems simple enough. The NGO advisers say that at the moment not all switches can be turned on at the same time. And so some are turned off. Tensions again arise as some poorer families who had not joined in on the program or could not afford the 2000 kip monthly payment that would follow after the first year of use, were saying that only the privileged few in the village were benefiting from electricity. To appease tensions, 3 poorer families were selected to have their homes hooked up with electricity. It's a poignant scene to see a family's first dinner with light coming from a light bulb. Or in the school where the kids all now have light. The schools teach the kids to be careful of electricity and from being electrocuted. There are scenes of the village celebrating and having a ceremony at the end of the project. What's more interesting is the follow-up after 3 months since the implementation! When the team and camera crew go back to visit, they find that the village has installed an additional turbine on their own and it works perfectly. Physically, the village looks different. Homes are now being rebuilt with more modern materials (ie. brick and concrete). Satellite dishes, TV, and stereo systems abound. However upon visiting the school they noticed that there's no more light. Why? The light bulb has blown. Quick fix for that! One of the team members installs a new light bulb. There are also the perils or the downside of electricity, as identified by the villagers. Noise pollution is one. The village stays up a lot later. In particular, the younger generation love to listen to their loud music causing noise disturbances and sleeping of their neighbors who are accustom to sleeping early and waking up early. TV, movies and other entertainment also serve to show a different life outside of the village. A woman comments that from what she has seen, she now believes her daughter has more choices such as a life outside the village if she so chooses and that education is very important. The woman goes on to say that her daughter need not be bound to village life her entire life. Horizons are expanded. Another woman interviewed goes on to say, that her life as a mother has fundamentally changed very little with the arrival of electricity. Another young woman is shown to be going through an arranged marriage. Admittedly, she does not look particularly happy. Even arranged marriages are being questioned by the younger generation in part because of what they see on tv or in movies, where characters generally marry out of love and not obligation. Additionally, not everyone in the village can afford electricity, tv or a satellite. Those that do are shown to have created a little business for themselves. Pay per view! They charge pay per view to those who want to come and watch right in their living room. Finally, the film shows that outside the village further away is a large Chinese funded dam being built. Showing the viewer again, that the electrification of Laos comes in both big and small ways. For the village, the electrical genie has been let out of its lamp. P.S. I wish the video was posted somewhere online but haven't found it. So if you do want to watch it you'll have to find it your nearest library or you could order from the publisher's website but it's a bit pricey at $90.